A Crew can contain several different types of models depending on how a player constructs it. Masters can manipulate the course of events in the world around them, changing their own Fates through their control or theft of Soulstones. A variety of fantastic and frightening beings, collectively known as Minions, serve the Master as fodder in his or her machinations. Visit the official gameplay page to learn how to get started. Wyrd Miniatures has put a lot of effort into their dedicated Malifaux site to allow you to explore the game, download useful resources, and participate in community forums. A skirmish game set in the World of Malifaux, accessible through “The Breach”, where magic is real through the use of a natural element called a soul stone, and nightmares become reality. You choose one of five factions that suit you Arcanists, Neverborn, Guild, Outcasts, or Resurectionists, and then fight to control your part of Malifaux, or all of it. No dice, actions are accomplished through a “fate deck” shuffled and cut every turn. Sometimes fate is on your side, sometimes it is not. Sometimes your master can “cheat fate”, you decide if it is advisable. The real appeal of Malifuax is the miniatures. Aside form individually packaged, Malifaux factions are packed in a boxed set, five to six miniatures you paint and then use. Zombies, witches, undead *******, dogs, cats, snakes, cowboys, show girls, a mad hatter, even Ninja’s, you decide which to begin the adventure with. Starter boxes are priced around $35-$40 USD, the Basic Rule set is $35USD and the fate decks are $7.50USD, but any normal 52 card deck can be used. Played in a 3’X3′ area, the basic “brawl” of two starter sets can be finished in about an hour and a half. Factions take turns activating one character per side, once all have been activated the turn is over. Five turns decides the game. . .unless fate steps in. Malifaux is a product of Wyrd Miniatures, Try it, ask a Henchman! I got lured in to playing this with friends. It is not my type of game and I will not be playing it again. This does not mean it’s a bad game though. You construct an army and fight other another player’s army. Like many other games of this type it does have a dedicated following throughout the country and you should be able to find opponents. The game and expansions are available at hobby game stores throughout the country and there are tournaments sponsored all the time for those with a more competitive itch. 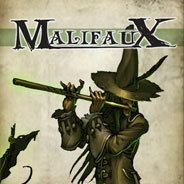 Add a Review for "Malifaux"